Within walking distance of a sandy beach, this well located holiday rental property has a private swimming pool with patio from where you can enjoy views of the sea. Villa accommodation covering 100 m² for 6/7 people, 3 bedrooms, 1 shower room, wifi, satellite television. The house has a living and dining room along with a separate kitchen which opens onto a covered patio terrace. Double bedroom and two twin bedrooms (2 x 90 cm wide beds in each) of which one has a pull out single bed as well. Shower room and separate toilet. The pleasant enclosed garden covers 500 m² and has mature trees, an eight-metre long pool as well as an outside shower. The covered terrace is ideal for eating outdoors and there is a built-in barbeque for grills. Puerto Blanco beach 600 meters. Les Urgues pebble beach 1 km. 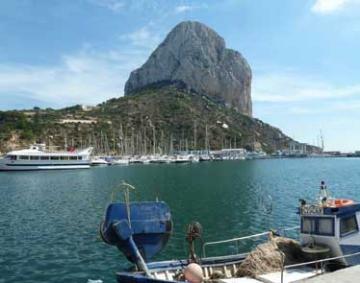 Calpe centre 1 km. Rail station 2 km. Supermarket 3 km. Terra Mitica theme park 25 km. Aqualand 25 km. Alicante airport 75 km. Security deposit: 200 € to be provided on arrival. - Compulsory supplement to be paid on arrival: 160 €, including linen, final cleaning and wifi. - Cot: 25 € per week. - Extra bed if accepted in the villa: 90 € per stay. - Pets allowed on request: 45 € per stay. Supplements must be paid on site by cash or credit card upon arrival.